• To share and develop disabled-friendly infrastructural settings in institutions and to campaign for and facilitate their implementation. The workshop started with a mapping session, where the expectations of the participants were recorded along with identifying and listing the challenges in care-giving. 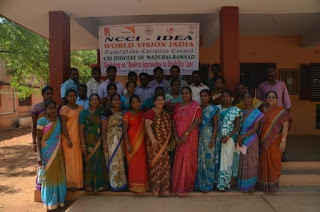 Mr. Alan (World Vision India) facilitated this session. The participants were made to work in for identifying their purpose and setting their activities. The groups highlighted the purpose aims and objectives of their respective care-giving Institutions. In another activity, Mr. Alan asked each participant to look at some given pictures (like the candle, tree, ship etc.) and then to write down the seen and unseen character of the picture. This activity not only gave a clear picture of recognizing the hidden talent of person with disability but also the keen observation of the care-giver. The session was helpful as it enabled the concerned Caregivers to understand themselves and their care-receivers leading to a better proactive mode for understanding modern Approaches to Disability Care. Mrs. Avitha Daniel (Jesus Enables Ministries) facilitated a discussion on Different Types of Disabilities, how to approach them, and what should be the qualities of the care-givers. She also initiated a group activity emphasizing on the support through accompaniment needed for the development of the Person/Child with disability. During this activity four persons were chosen to represent each disability where each of them had to take a step forward for every positive thought shared and a step back for every negative thought thus reaching the target finish line. It was amazing to see the positive energy flowing through this activity where each care-giver demonstrated his committed skill in caring for their care-receivers. She went on to highlight the essential qualities required of the care-giver in facilitating the development of children with special needs and also the importance of educating the parents and their relatives about the various existing govt. schemes for the PWDs. The second day (17th April 2016) started with morning devotion. Mr.Paulraj, Headmaster, CSI High School for the hearing impaired, Schiyapuram led the worship and Mr. Allen Shared the word of God. Mrs. Avitha Daniel facilitated this session. She introduced the present and modern approaches to disability work both at technical and at ministerial levels. In this session she also highlighted the unintentional attitudes towards PWDs. She invited the caregivers to come forward and share their best practices as individuals and as Institutions. This session also included a space for analyzing the traditional institutional attitudes toward PWD. The participants also were inspired to adopt alternate approaches both at administrative and ministerial levels. It Mr. Allen facilitated this session with group activities. Participants were blindfolded and asked to draw a tail for an elephant. Through this activity he shared the importance of accompanying and guiding the PWD to give their best potentials. This activity was found useful and the participants were inspired to decide to become the best possible accompaniers. Mrs. Avitha Daniel facilitated the concluding session of the workshop. This was an eye opening activity for the participants to understand the challenges faced by a PWD in this inaccessible society because in this scenario the PWDs completely trust their Care-giver/accompanier’s guidelines in accomplishing their goals or to perform their daily routines and if they do not hear their care-givers voice they become more disabled in this fast moving world. Thus she emphasized the importance of the care-givers role who will not only accompany them but also builds a platform for PWDs to express and share their experiences. Hence the care giver should have genuine concern for their care-receiver. She concluded the session showing a Special Olympics video on a Mentally Challenged Athletic. The two-day workshop ended with the closing act by, the Rt. Rev. Dr. M. Joseph Bishop, CSI Madurai-Ramnad Diocese and President of TNCC. Bishop invited all the organizations to work towards the inclusive society where every PWD and their families would be accompanied by societies and communities around them. The Office Bearers of the Diocese, Correspondents of the Care-giving institutions and clergies from different ecclesial confessions were part of the inauguration. Mrs. Leela Manohari(Bishop Amma) Rev. I Stanley Jeyaraj, Council Chairman and Rev. Jeyasing were also present. Bishop called the participating PWD members and were given an opportunity to share their learning from this workshop. The workshop ended with prayer and benediction by the Bishop. Mr. Augustin Ponraj and Rev. M. Dayalan Barnabas coordinated this entire workshop. Ø Stakeholders/Care-givers understood the impediments faced by a person or child with disability and the use of different techniques that would help the child perform better. Ø They were able to identify the resources and talents of the PWDs’ by helping them to articulate the same.